With the solar and lunar eclipses, the transits of Venus and Mercury are among the most spectacular and commonly known celestial events. But most people are unaware that there are other transit phenomena in the solar system such as the transits of the Galilean satellites of Jupiter. The outer planets cannot undergo transits because they are very far from Earth and their disks are very small. All that can occur is that they obscure each other. Then we observe a kind of eclipse which is called an occultation. But there is another case when the orbits of the satellites of the outer planets are almost equatorial and coplanar. 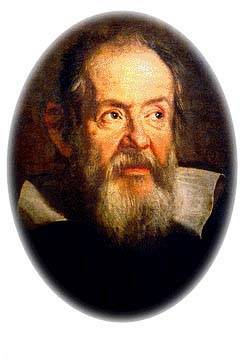 These conditions are satisfied perfectly by the four Galilean satellites of Jupiter. 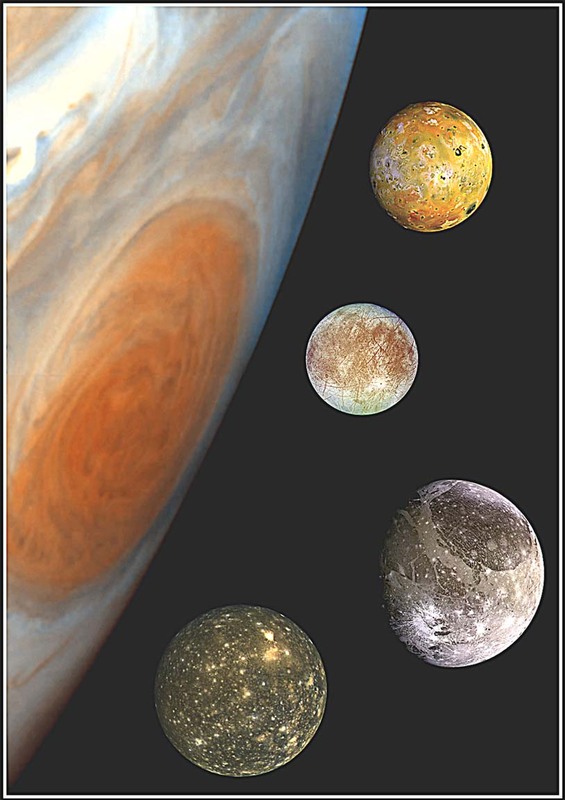 Their names are Io, Europa, Ganymede and Callisto and these moons were discovered by Galilei Galileo in the early 1600's. From night to night, even through binoculars, the ever changing aspect of these four natural satellites may be observed. The observation of the moons on consecutive nights shows them appearing only to disappear and reappear again with no apparent pattern. Some nights there may be four moons, the next night only three; sometimes only two are seen. The "balance" of the four moons changes, sometimes four moons on the right side of the Jupiter, at other times one on the right and three on the left and so on. What the observer is actually seeing is the rotation of the satellites as they orbit Jupiter like a small model of our solar system! 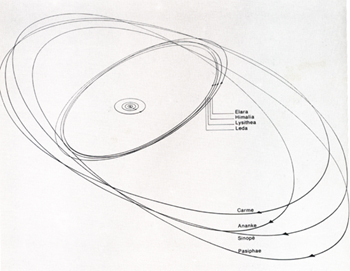 The Galilean satellites of Jupiter orbit from east to west as seen from the Earth. 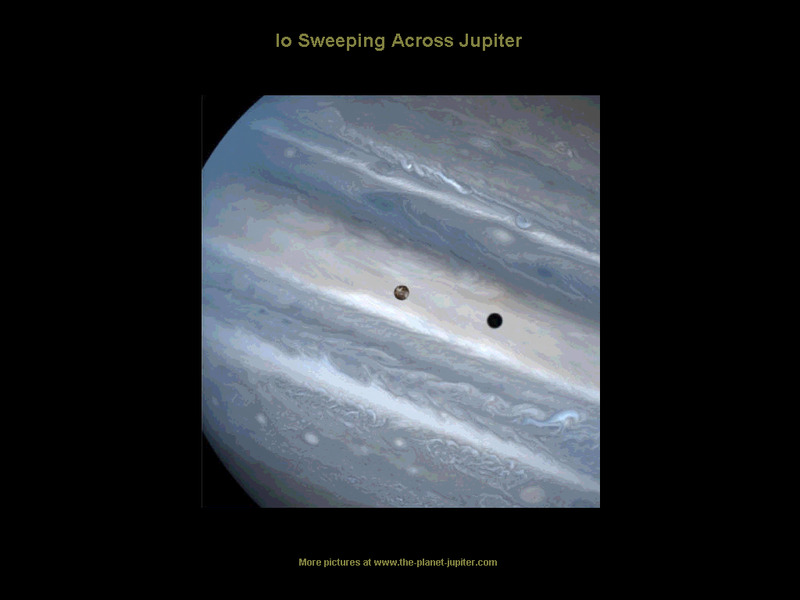 Io, the innermost, speeds around Jupiter in just under two days (about 43 hours). 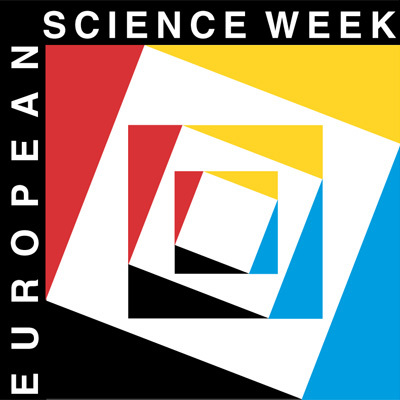 Europa is seen to orbit in 3.5 days (about 86 hours), Ganymede orbits in just over 7 days (about 172 hours) and Callisto orbits Jupiter in just over 16.5 days (about 399 hours). It is interesting to note that the orbits of Io, Europa and Ganymede are locked together in a pattern. The orbits are all nearly circular and the periods are almost exactly in the ratio 4:2:1 respectively. This means Io does four orbits of Jupiter and Europa does two orbits while Ganymede does one orbit. This "interlocking" of the orbits is called a Laplace Resonance. Each moon is also tidally locked to Jupiter with its rotational and orbital periods being equal. 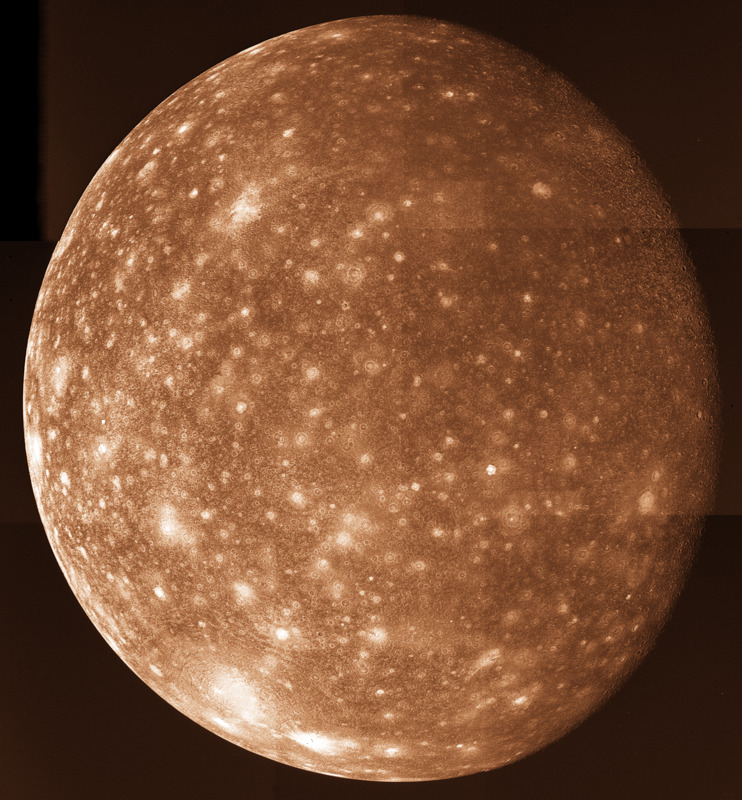 Callisto, the outermost of the four, is not orbitally locked to the other three major satellites and just orbits Jupiter at its own pace. Its colour is due to sulphur compounds from frequent volcanic eruptions. The eruptions are geyser-like and create a very young surface without impact craters. Io;s interior is heated by tidal flexing from the 1:2:4 ratio of the orbital periods of the other Galilean moons. A ring of charged particles encircling Jupiter at Io's distance, called the Io torus, shows interactions between the ring and Jupiter's magnetic field and produces strong radio emissions. Io may have its own magnetic field! It is composed primarily of rock covered with a smooth layer of H2O ice. Geologically active with indications of a subsurface layer of liquid H2O (an ocean?) or soft ice. 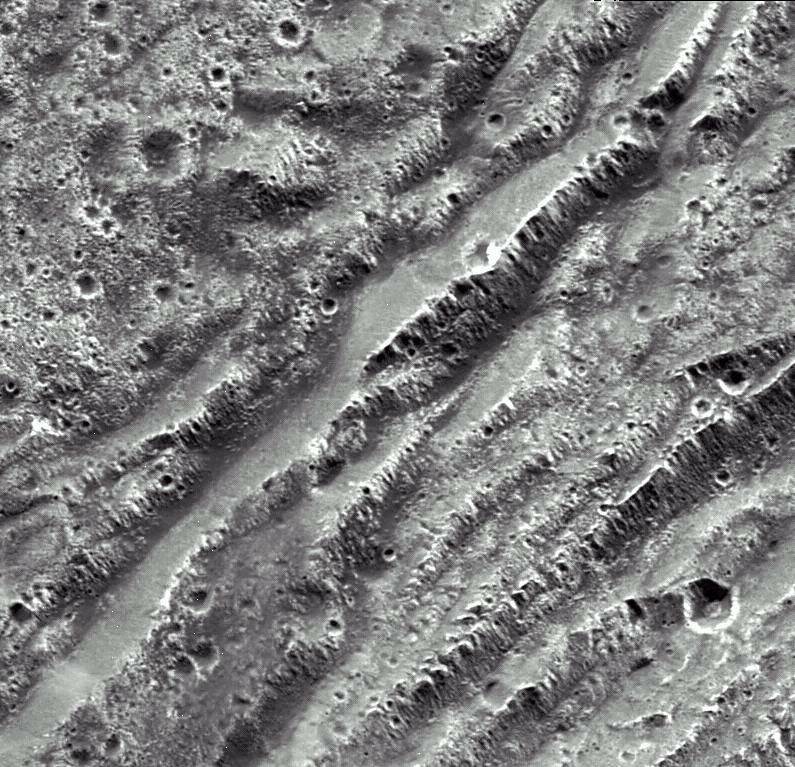 There is an absence of craters and a network of cracks and ice rafts covers the entire surface. Tidal flexing is responsible for internal heating. Induced magnetic field from dissolved minerals in a subsurface ocean? It has a heavily cratered icy surface. There are islands of dark ancient surface separated by regions of heavily grooved, lighter-coloured, younger terrain. The moon is highly differentiated with a metallic core in its centre. Ganymede has a strong magnetic field with a magnetosphere. Its tidal heating is small now but may have been significant in the past. It has a heavily cratered crust of H2O ice. The moon has a little geological activity and never had significant tidal heating. An unknown process erased the smallest craters and covered the surface with dark dust. The existence of a magnetic field suggests a shallow subsurface ocean. The unusual nature of the orbits of the satellites is not the only matter of interest in the Galilean moon system. Earth orbits the Sun closer than Jupiter so we appear to catch up with Jupiter and pass it at opposition about once every 400 days. Because Jupiter's polar axis is inclined by only 3 degrees, the Jovian moons can be seen crossing the planet itself or they go through the umbral cone of Jupiter just as our Moon goes through the umbral cone of the Earth during a lunar eclipse. The crossing of Jupiter's disk by one of its satellites is known as a transit, similar to the transit of Mercury and Venus across the Sun. But the transits of the Jovian moons happen a lot more frequently than a planetary transit of the Sun! The Jovian moons are fairly bright at around 5th magnitude but against the highly luminous disk of Jupiter can be easily missed. Just prior to a moon entering a transit, the moons are easy to spot against the blackness of the night sky. As the satellite crosses the limb of Jupiter, the moon can still be clearly seen since the limb of Jupiter is quite dark. Once the transit is well under way, it can be very difficult and sometimes impossible to see the moon itself against the bright zones of Jupiter's gaseous atmosphere. If the transit happens to occur against a cloud belt then you will be able to see the moon throughout the whole transit. The Sun's angle relative to the observer on the Earth dictates when a transit of a moon and its shadow occur in relation to each other. As the Earth approaches opposition with Jupiter, the shadow of the Jovian moon enters Jupiter's disk before the moon itself. As the Earth catches up with Jupiter at opposition, the Sun, Earth and Jupiter line up. If a transit occurs it will follow or precede the moon by only a minute. If you want to know what kinds of phenomena the Galilean satellites of Jupiter will show during any month, look in any astronomical calendar! 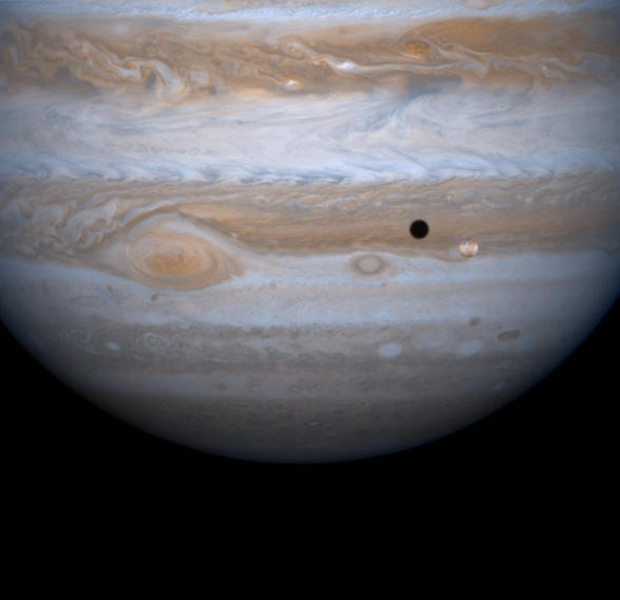 It is actually possible for a Jovian Moon to eclipse its own shadow, but this is rare. One of these rare events takes place at 11:00 pm on November 28th, when Io will actually eclipse its own shadow!